What’s not to love about this 16th century public house that sits along the Swale Estuary on the Isle of Sheppey. The venue is so cosy it can be a very popular choice for a winter wedding. However with such a vast amount of outdoor space it also works very well in the summer. The Ferry House Inn can cater for outside weddings as well as ceremonies inside in the barn section of their beautiful venue. There’s also a fire pit for when light levels drop, and everyone likes a fire pit right? Go and check out the Ferry House Inn here. I’m a bit biased on this one, as it’s where I married my wife. Such an exceptional space with plenty of grounds to explore, and such beautiful indoor spaces too. Again, this is a venue that can cater for an outside or an inside ceremony. The walk over the bridge to meet your guests at your reception is a pretty cool thing to do. As for pictures, well you’re spoilt with such great locations without walking more than five minutes. There’s a waterfall, a lake, a bridge…well what more do you need? Want exclusively and one of the best venues in Kent? Click here. 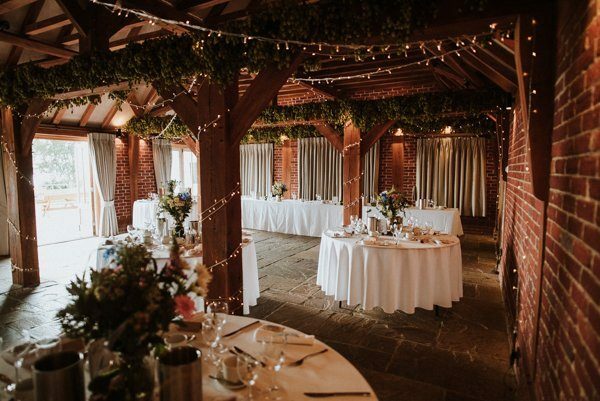 This exclusive venue set in the Kent countryside has plenty of character. Set in an apple orchard the self contained buildings offer the flexibility to have your wedding how you want it. As for pictures? Well it’s set in an area of outstanding natural beauty, so there’s no problems there. Head over to their website and take a look around, this is such a special venue. This sound like your idea of a wedding you won’t forget? Click here. After a unique and relaxed wedding? Well, the Oak Grove is just for you. Set between two countryside villages in North Kent and on the banks of the River Medway, you can have your wedding day how you want it. This venue caters for inside and outside ceremonies, but if the weather allows I’m sure you’d opt for the outside option under the Living Willow Arbor. This venue hasn’t been around long so you’ll be sure to wow your guests when they arrive. You want relaxed, secluded and something to make your own? Well I’m sure I don’t need to write about this venue, if you’re from Kent you’ll be familiar with Leeds Castle. It’s been around for over 900 years! What a place this is to tie the knot. Imagine photos as the sun dips with a backdrop of the castle and the moat…does it get much better than that? It’s not known as ‘the loveliest castle in the world’ for nothing! You want that backdrop and to wow your guests? Click here. When you’ve sorted your venue head back and contact me to sort your wedding photography.